The sacrament of Baptism is the first sacrament we receive and is the beginning of our involvement in a community of faith. We become a child of God at Baptism. Because this sacrament is so important, there are preparations that must be made for it. No dates for baptism will be given on the calendar until all the necessary documents have been received here at the Parish Office. Contact the Director of Faith Formation to get the forms to be completed. When all the forms: the family information sheet, the copy of the birth certificate, the godparents’ verification forms, and donation, have been received, we will then put a date for your baptism on the calendar and schedule the date for the class which must be attended by the parents and godparents, if needed. 1) The parish requires a minimum of six (6) months in order to complete the preparations before the Rite is performed. It is necessary that parents plan accordingly especially if guests are coming from out of town to celebrate this Rite. 2) The parents select godparents, one man and one woman, to stand for their child in the Rite. 4) The parents present the church with all the necessary personal information for the baptism, including a copy of the birth certificate. They may not be the parents of the child to be baptized. Children seven years of age or older, who have not been baptized, must begin the RCIA (Rites of Christian Initiation of Adults) process in order to be baptized. They will receive all three sacraments of initiation, Baptism, Confirmation, and Holy Eucharist, at the same time at the Easter Vigil. This process may take from one to three years depending on the age of the individual. The members of the Church take great joy in the baptism of a child, regardless of age. 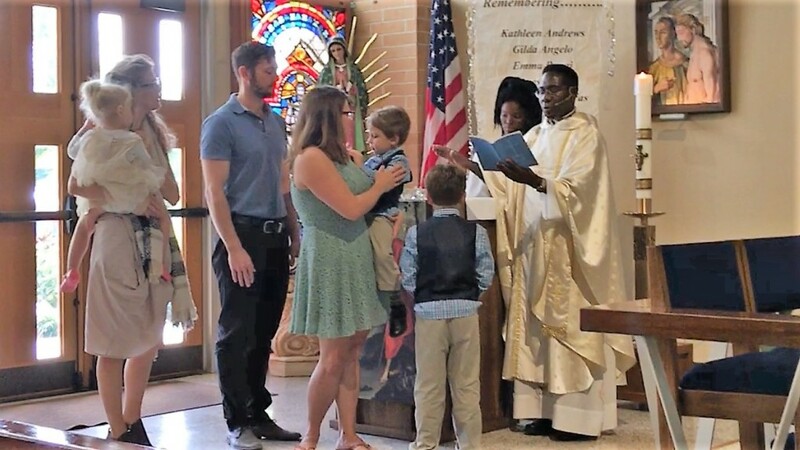 We wish to assist the parents and godparents in making this a wonderful, joyous occasion as this child enters the community of faith at Most Holy Name of Jesus. Please help us by planning for your child’s baptism with the dignity that this important first sacrament deserves. In order to begin the planning of a baptism, call the DRE at (727) 347-9989 x 302. The parish requires a minimum of six (6) months to prepare for a baptism.